I am Mike’s Deep Neck Flexors, and I am lazy, and literally a pain in the neck. 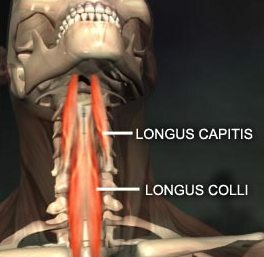 I am actually we (the Longus Coli and Longus Capitus, hope you took Latin), but for this you can just say me. I also go by DNF, but not PNF, which is a whole other blog post. I am supposed to be a somewhat stable force in Mike’s neck, making sure other muscles do their jobs, mostly the global muscles like the upper traps, sternocleidomastoid and levator scapula, and a couple other big words that make me sound smart. When I notice that some of my buddies I just mentioned want to take over my job (stabilizing the neck) I love to sit back and take it easy. The only drawback to this is I get weak. I start to look like Arnold Schwarzenegger now rather than before. I get a little weak while the UT, SCM, and LS start to get tight so Mike’s neck is nice and supported. Obviously when these guys get tight they can’t function right because they are terrible multi-taskers. This leads Mike to have all sorts of trouble. Tight upper traps, headaches, TMJ, shoulder dysfunctions, swallowing problems, rounded shoulders, back pain, even calf and foot pain (seriously) are just a few of the ailments. The big problem is that when I take it easy, I’m very stubborn when I am asked to get back to work. I will resist all day. When Mike sits or stands I am going to want to take it easy, like I said earlier; I. am. LAZY! Then when Mike thinks I’m getting back to work I pull an A-ROD and try to cheat (I am referring to this picture and not the steroids, because even though it hurts me to say this being a Red Sox fan, at least he admitted to it. You see Tiger, sometimes the truth DOES set you free.) It’s usually hard for Mike to tell if I am working because I don’t create a lot of commotion. Also, it’s quite easy for my buddy the SCMs to do the work for me (he’ll do anything for a couple bucks, and I mean anything). So chances are if you are reading this, you’re sitting, or should I say slouching at a computer letting YOUR deep neck flexors off easy. Just remember when your neck, back, and jaw hurt that I didn’t warn you to sit up straight and pull your head back over your shoulders. I am Mike’s Deep Neck Flexors, and I am lazy. All too often I see massage therapists trying to get the traps, levator, and SCM to relax without addressing the weakness of the deep neck flexors. You should do a little video series on exercises for this muscle group. On another note, a cue I once heard was to pretend your head was a helium balloon floating directly above the shoulders. Thoughts on this? Thanks for the reply. You’re not the only one who seems to see people addressing tightness without taking care of “local’ muscle weakness/deficiencies. I actually have a short vid on postural muscle training while sitting at a desk under my Video page. Chin tucks are the big one, but they are most effective with a biofeedback unit/blood pressure cuff behind the head in the supine position. As far as the helium balloon goes, I believe this is a good cue to remind people to keep their heads up (especially in runners), but I do not know how effective this is in promoting proper firing of the DNF’s. Teaching relaxation of the UT/SCM/Lev. scap is difficult but much needed in patients/clients that present with global muscle tightness to provide support for the cervical spine. Also, soft tissue work and postural exercises cannot be the only approach. Chances are proper motor control must be taught in the force couples of the periscapular muscles, mainly the upper trap and lower trap, with verbal and tactile cuing, not just strengthening. I personally like the idea of chin tucks, but when I do them I seem to feel them in my posterior neck muscles as opposed to my DNF. I understand the concept, but I must be doing something wrong. This is a common complaint of the chin tuck, and it is often due to one of two reasons. 1. They are being performed too aggressively, therefore the posterior cervical spine muscles are being recruited, or 2. the motion is being performed through too large of a range. Try to place your hand across your neck feeling for your SCMs. If you perform a chin tuck and you feel your SCM “pop” out into your hand you are doing them too aggressively. As far as the range of motion goes, you should be able to perform it without getting discomfort in your posterior neck, many times the ear will only translate about 1/2 inch when starting the exercise. My DNF’s are weak and I am suffering from heavy head and overworking SCM which tend 2 ache when I do too much. I have bought a pressure biofeedback unit. When doing exercise I can feel very slight contraction in SCM on palpation. Does this mean the SCM is doing the flexion? If so how will I recruit the DNF and switch of the SCM?? It is very difficulty to “shut off” the SCM; however, if the chin tuck exercise with the biofeedback unit is performed slooooowly it should be easier to get less contraction from the SCM. The DNF are working even if you feel the SCM minimally firing. The performance of the chin tuck should not actually be a flexion motion, it should be more of a backwards translation of the head on the neck, resulting in a slight “double chin”. Under my videos, I have an example of a standing chin tuck, which shows you the type of motion that should be performed; however, it sounds like you should be laying down still. Best of luck.